After nearly a week with the new HP TouchPad and webOS 3.0 my overall impression is that the TouchPad is less than the sum of its parts. There is nothing the TouchPad does that the iPad cannot except play Flash video (sometimes). I could not find one feature or function that was significant or compelling enough to take the TouchPad seriously compared to the iPad. What webOS has that iOS doesn’t is not so much found in a feature comparison as opposed to functionality differences. webOS has some very clever approaches to common tasks and needs: such as the popular card view approach to fast-app switching, global notifications, and a few other things. And though I consider webOS to be very clever in certain areas, I do not find it to be fun. When opening the box you don’t lift off the top, you slide out a drawer. The TouchPad itself is wrapped in plastic and underneath it you find a sunken cardboard “pouch” with a thumb tab to pull it out — just like you would find underneath your iPhone or iPad. The cardboard pouch says, “Now comes the fun part.” Inside there are a few documents, including the users manual, and a microfiber cloth with the HP logo embossed in the corner. The only thing missing are a couple of white HP stickers. Next to where the TouchPad sits is a compartment holding the micro USB cable and the charging wall wart. They are both black and high quality. The wall wart is a round spherical shape with prongs that fold in and out. After using an iPad or iPad 2 for the last 18 months, the plastic back of the TouchPad instantly felt cheaper and flimsier. The whole shell is bendable and flexible. If I were to hold the device in landscape mode with one hand on each of the two sides I am confident that I could twist and crack it. There are some cases when the friction of the plastic back is welcomed. Since it provides more friction than the aluminum back of the iPad the TouchPad is easier to hold or carry without fear of it sliding out of my hand. However, due to the TouchPad’s weight, it is not any easier than the iPad is to hold in portrait orientation using one hand while reading. On the top of the TouchPad there is a Lock button on the right and a headphone jack on the left. The right side of the device has a volume rocker at the top, and at the bottom is a small pop-out tray with the devices serial number. The bottom of the TouchPad has a micro-USB input. The left side has stereo speakers — one on each edge. There is no toggle for mute/orientation lock. However, you can quickly access both of those options via a settings pane which is available from anywhere at any time. But more on that in a bit. On the front of the TouchPad is a camera at the top and the Center Button (Home Button) is on the bottom. The center button is not round, it’s a thin rectangle with rounded edges — the size and shape of a long Tic-Tac. What I like about the Center Button is its thin LED bar which slowly pulses when you have a new notification. Pressing the Center Button will turn on the screen if the TouchPad is locked, enable the Launcher if you are in Desktop/Card view, or it will take you to Card View if you are in an app at full screen. The screen itself is the same Gorilla glass as the iPad and is just as prone to fingerprints. To power the TouchPad on or off you hold the Lock button. If the device completely freezes up on you (which has happened to me once) you can hold the Center and Lock buttons simultaneously to force a power-down. My TouchPad loves to be in landscape mode. If I’m holding it in portrait orientation I have to watch out because it will rotate into Landscape at the hint of a tilt. Trying to get the screen to then rotate back into portrait usually takes several seconds. Sometimes I shake it up and down to see if that will help but it never does. Plugging the TouchPad into my Mac via the USB cable brought up a prompt on the device. It told me that for optimum charging I should plug it into the wall. Or, if I wanted to use the device in USB mode then I could. If the latter, you have to tell the TouchPad to go into USB mode. While in USB mode, the sceen shows a giant USB logo and your computer shows a device named “HP TOUCHPAD”. USB mode gets you access to certain files and folders on the TouchPad: A PDF titled “Open Source Software Information”, and 5 folders titled: downloads, wallpapers, screencaptures, ringtones, and DCIM. A sixth folder will show up if you download the HP Play app to your computer in order to sync iTunes music to your TouchPad’s library. But more on that later. Moreover, you can add your own files and folders here (such as a folder with DRM-free music and videos, as well as documents, and/or photos) and the TouchPad will find them and they’ll appear in the relevant apps to display or use that media. This has been my first extended experience with webOS. The software feels far more engineer-y than I expected it to. This is a broad generalization, but I think it gets the point across: if webOS sits somewhere in between the utilitarian appeal that is Android and the emotional appeal that is iOS, then it is certainly closer to the utilitarian side than I expected it to be. Highlights of webOS include notifications, multitasking, and a quick access pane to common settings. Lowlights include maddening performance on the TouchPad, a shortage of fine apps (built-in apps included), and several dark corners which need refinement to the user interface and user experience. I have heard so many good things about webOS that I was truly expecting to be impressed by the TouchPad and to enjoy webOS. Alas, using the TouchPad for the past week has not been impressive or enjoyable. And it’s not for a lack of apps — I was able to find a native TouchPad app for nearly all my “killer app” needs. webOS has an amazing fast-app switching functionality out of the gate. The system-wide notification system is very nice — there is an addicting little settings pane which is available at any time and lets you adjust brightness, etc… But just because there are features of webOS that I would love to see find their way into iOS, I would rather use the iPad and iOS of 2010 than the TouchPad of today. Because webOS — as clever as it may be — is not a delight to use. It is slow, awkward, and requires a great deal of determination. Or, put another way, webOS is clever but not fun. While the TouchPad is booting up the HP logo sits centered on the screen. As webOS gets closer to being fully loaded the logo begins to pulse with a white glow coming from behind it. The closer it gets to being loaded the quicker and more radiant the logo pulses. When the TouchPad is finally booted it chimes and vibrates. When you start up the device for the very first time you activate it without ever connecting it to a computer, though not without connecting it to Wi-Fi. During the initial setup you are asked to sign in with a pre-existing HP webOS Account or else create a new one. Setting up my new HP webOS Account was very easy. I was given the options to add email accounts and calendar accounts to my TouchPad. webOS offers MobileMe as an option for email, but it won’t sync with my MobileMe calendars or contacts. It does sync with Google calendar, contacts, email, and documents but, alas for me, all my calendar and contact info is in MobileMe. You can also sign in to an Exchange account, Yahoo, your own IMAP server, or look for other services. Once you’ve set your first email account up, you can add more. Or if you want to add more later, you can do so from the Launchpad → Settings → Accounts. Having a webOS account means your TouchPad will automatically back itself up, over the air, once a day. My most recent backup was completed this afternoon at 2:26 as the TouchPad sat in my bag while I was working on this article at a local coffee shop. Your HP webOS Account and other personal data (including potentially sensitive data that may be provided during the use of the device and its features) are backed up automatically every day. This data is stored on secured servers used solely for recovery purposes. HP hosts a web page listing exactly what does and does not get backed up. Some notable things include the apps which you’ve downloaded via the App Catalog but not their settings and data. Website bookmarks and cookies are backed up, as are memos, and messages and conversations via SMS, MMS, and IM. Photos, videos, and music are not backed up and no passwords are backed up, just usernames. In short, if you dropped your TouchPad in a lake and had to start over with a new one, certain media would not be recoverable (music, photos, videos) unless you had it backed up on your computer, but the overall setup of your TouchPad (apps, accounts, and some settings) would be restored. For the paranoid at heart you can disable automatic backing up. And if/when you do, all your backup data that is stored on HP’s servers will be erased. You can, of course, turn backups back on again at your convenience. The webOS browser is based on WebKit. It supports HTML5 and has a working version of Adobe Flash. Web sites without a lot of Flash load very quickly. And there is virtually no lag when scrolling around on a web page. On several common websites that I visit, once the page had loaded I had no trouble scrolling down as fast as the TouchPad would let me and I almost never saw checker boarding. However, the TouchPad’s browser does not render all sites perfectly. I noticed on a few sites where header divs seemed to get cut off a bit too soon on the right-hand side. Moreover, the TouchPad does not render TypeKit fonts; though shawnblanc.net still looks quite handsome on the TouchPad. After visiting my site with the TouchPad and then checking my analytics, Mint logged the TouchPad’s browser as “Safari 534.6” and the Platform as “Linux”. Flash works better than I expected but worse than I’d like. I was unable to watch a 720p video on Devour’s home page, but I was able to watch some shorter, lower resolution videos from YouTube and Hulu. I also was unable to watch the latest episode of Put This On without it stuttering and downsamping to a lower resolution. So, while waiting for the episode to buffer on the TouchPad, I pulled out my iPad, navigated to the site, and watched the the show in full-screen at 720p resolution. Stay classy, Flash. In the browser’s settings you can disable Flash if you like, or you can choose to not have it autoload and play when you visit a site. However, the device requires a reboot for the preferences to take place. I had selected to disable Flash yet Flash videos were still viewable and even Rdio worked. In theory, the TouchPad gives you “the full web”. In reality you get less. The 5 apps that come in the Dock are Web, Email, Calendar, Messaging, and Photos & Videos. Additional apps that the TouchPad ships with are Memos, Maps, Contacts, Phone & Video Calls, and Music. What the Home screens are to iOS, Launcher is to webOS. You can bring up Launcher three different ways: (1) by tapping the arrow icon found in the right-hand side of the Dock; (2) by clicking the Center Button when in Card view; or (3) if you enable “advanced gestures” under the settings for Screen & Lock then the Launcher can be brought up at any time by swiping up from the bottom of the screen no matter what orientation the device is in. The Launcher has four tabs across the top: Apps, Downloads, Favorites, and Settings. The Apps tab contains default system apps. Downloads contains a link to the HP App Catalog and is where all the applications you download from the App Catalog go. Favorites is empty and waits for you to populate it, though if you save a Web page as an “app” then it will appear in the Favorites tab. The Settings tab is where the all the different mini-apps are kept for managing accounts, backup, bluetooth, sounds, software updates, etc. You can move the apps into any tab and into any order you like by tapping and holding them. A grey box appears around the icon and then you can move them as you see fit. And apps you have downloaded from can be deleted by tapping the “x” that appears. Finding and downloading an app from the App Catalog is simple enough. You can search on your own, or look through lists of the most popular, or most paid for, etc. As of this writing, the vast majority of apps in the Catalog are designed for the Pre, not the TouchPad. Fortunately, above the button to buy/install an app it will say “For TouchPad” if it’s optimized for the tablet. According to HP there are over 300 TouchPad-ready apps in their Catalog. When buying an app you have to enter your HP webOS Account password and then confirm that you do in fact want to purchase the app. If you are downloading a free app you are not asked to authenticate with your password. For Instapaper: Paper Mache is the Instapaper app for webOS. The developer, Ryan Watkins, is clearly an Instapaper fan. The app has all the functionality of Instapaper on the iPad, plus it is able to sync in the background. Even when the app itself is not running. For Simplenote: pondNotes is the Simplenote app for webOS. Though it is not as elegant or quick as Simplenote on iOS, it is functional and so at least you can have read/write access to your notes. For Twitter: Spaz HD is currently the only Twitter client for webOS. I wish there were other options. And, alas, for some reason I was unable to log in to twitter.com and try the mobile version of the site on the TouchPad. For RSS: There is not yet an RSS reader that syncs with Google Reader. And using Google Reader’s mobile web app on the TouchPad is nearly useless. It does not render or operate properly in the TouchPad’s browser. And so, the first significant workflow problem I encountered with the TouchPad was an inability to read my RSS feeds. Pandora: They have a native webOS app, but it is built for the Pre. However it does work on the TouchPad. Pre-sized apps run in their normal size inside the outline of an HP Pre. Kindle: The Kindle app is coming, but right now it is just a placeholder. 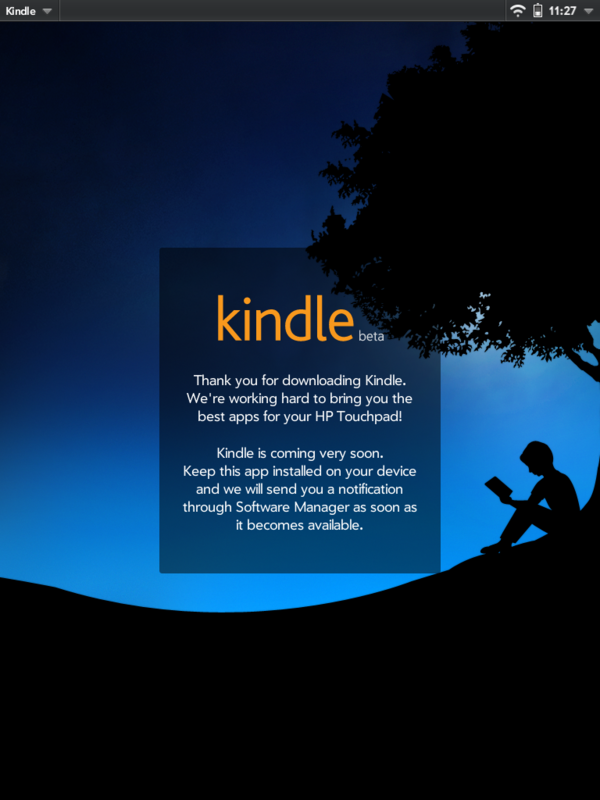 You get the familiar launch screen as the Kindle iPad app, and it tells you thanks for downloading and that they’ll let you know when the app is actually available by sending a notification through the Software Manager. For Writing: TapNote is a very nice writing app, and perhaps the nicest app I’ve downloaded from the Catalog. It cost me $5 and is a bare-bones plain text writing app that syncs with Dropbox and has full-screen mode. I found it much more appealing and usable than pondNotes. If I were going to do long-form writing on my TouchPad it would be in TapNote. Exhibition: This is one of the default apps that ships with webOS 3.0 and it is also one of the finer bits of good design on the TouchPad. It is a simple, full-screen app that displays the time, upcoming agendas items, or photos. I’ve always been a fan of the flip-style clock design, and the TouchPad’s looks great. Dropbox: There is not a Dropbox app in the Catalog, but rather a system-level sign-in for Dropbox. You go to the Launcher → Settings → Accounts → Add an Account → Dropbox. To set up your DropBox account you simply type in your login credentials. It doesn’t authenticate at the time of adding because I added my account without a problem despite the fact I had no Internet connection at the time. Your Dropbox account can then be accessed through the native apps on the TouchPad. Though the only app that I know of which accesses Dropbox is QuickOffice. It will let you view your documents and photos, but you cannot save them to your TouchPad, nor can you edit them. In fact, so far as I can tell, there is no way to edit documents or spreadsheets on the TouchPad. The way webOS handles app switching with its card view is one of the premier features of webOS. I like it, and the more I get used to it the more I understand why some users don’t want it any other way. Switching between apps by seeing the current screen rather than the icon feels much more natural and user-friendly. If you’ve ever wished that fast-app switching on iOS was more akin to the way you switch between multiple “browser windows” in Mobile Safari then you’ll know why card-view switching in webOS can be so pleasant. If you are working between two apps, or you open a new app and want to switch back to the previous one real quick, it can often mean scrolling several cards over. iOS attempts to solve this automatically for you by sorting the apps in the task switcher by the order in which they’ve been opened. In webOS you can solve it manually by rearranging and even stacking your cards. You do this by tapping and holding on a card — it will go semi-transparent and then you can move it around. webOS will let you open as many apps as you like until you reach the limits of your nerves or the TouchPad’s hardware — whichever comes first. In my own attempt to test the limits of webOS’s multitasking capabilities I was able to launch 15 cards (5 browser windows, email, the App Catalog, pondNotes, Paper Mache, Memos, Spaz HD, Photos & Videos, Music, Video & Voice calls, and Calendar). At this point a blank notification popped up in the top-right corner of my screen along with an accompanying alert sound and a quick vibration. I assume the notification had something to do with alerting me about the amount of apps I had open. But it was literally blank so I had no choice but to ignore it. It disappeared after a few seconds, but when I tried to launch a website from within Spaz, the Twitter app, I was taken to the leftmost browser card and then the same blank notification popped up, and the Twitter link did not open in the Web page. However, when not connected to the Internet the TouchPad handles multiple apps much better. When not online I was able to have 23 cards open without a problem or a blank notification. Apps remain open until you quit out of them. You do so by flicking the card up and off through the top of the screen. When you toss a card away it makes a nice “whoosh” sound. Something fun: if held in portrait orientation with the speakers on top, pulling down on a card makes a “crunching” sound, and then if you let go at the last second the card flies up and off the screen while shouting, Weeeeeeee! Here’s a homemade video of this in action. Another perk of webOS’s multitasking capabilities is that apps can update in the background if they want, even if they are not launched at all. Paper Mache, for example, can update its Instapaper queue so that it’s always up to date whenever I launch it. There is no way that I have found to quickly and simply scroll to the top of a page or a list view. In iOS you tap and hold the top of the status bar. In webOS if you’ve reached the bottom of a website or are 30 deep in your email inbox, you have to scroll, scroll, scroll all the way up. Secondly, you know how in iOS when you start scrolling down on a web page then the scrolling will “lock” in and it only scrolls down and up no matter if you move your finger left or right? The TouchPad doesn’t do that. The web page follows the movement of your touch pattern to the letter. To get music onto my TouchPad I started by launching the music app. It told me to go to hpplay.com or copy music to my device while it is in USB mode. So I put the device into USB mode (as discussed above) and since there was nowhere to put the music I decided to create a folder titled “Music”, put some DRM-free MP3s in there, and assumed that the TouchPad would find them. And it worked — once I had ejected the TouchPad from my laptop the songs appeared in my Music app and I could play them in stereo. Next I add some protected M4P files that I’ve bought from iTunes. I put the TouchPad back into USB mode and the files copied over just fine and they even showed up in the TouchPad’s music library. But the tracks would not play. No errors or anything; they were simply unresponsive to the play button. So then I downloaded and installed HP Play (which is currently in beta) onto my MacBook Pro. (HP Play looks like what an app would look like if someone built an iTunes clone using Adobe Air while imagining the year was still 1998.) I transferred over those same DRM M4P files from before as well as some m4a songs, but this time by syncing them via HP Play. The M4A files played just fine, the DRMed M4P files would not. HP Play does not sync video to the TouchPad. 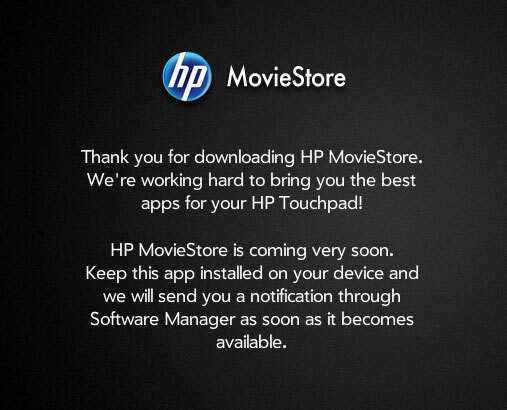 Which means the only way to get video from your computer to your TouchPad is to transfer it manually with the device in USB Mode or buy it from HP’s Movie Store app. I copied over some video files and they showed up in the Photos & Videos app just fine. The title of the video is the name as its parent folder. Protected videos, such as those I’ve bought from iTunes, will not play on the TouchPad. And the HP Movie Store app? Well, like the Kindle, it is also MIA. System-wide notifications are the other premier feature of webOS. They work the way a notification should, by being simultaneously useful and unobtrusive. Because just about any app can hook into the notifications, you can be notified about anything: new email, new mentions on Twitter, new Facebook messages, instant messages, the current song playing, and more. If you Pre is paired with your TouchPad then you can also get text and MMS messages on your TouchPad. Only apps that are running will send notifications. When a notification comes in, the text of it scrolls across a small area at the right-side of the status bar. Then, a small icon is left behind to remind you that you have a notification. If it’s an email, then there is a small envelope, if music there is a note icon, if a Twitter mention then it’s the star that Spaz HD uses in its unique icon. Tapping on the notification icon brings up a minimal popover. From there you can read the subject lines of your recent emails, and either slide them away to discard or tap on them to open your email and read that message. You can also control music playback via the notification popovers. Notifications will also appear on the Lock screen. They look exactly like their minimal popover counterparts found under the status bar but they are not interactive (save the Music notification which lets you pause, rewind and fast forward). You also get notifications about actions you’re currently performing, such as when an email has been sent or text has been copied. The same way a new email’s subject line will scroll across the status bar, webOS will tell you that you’ve successfully copied some text or that Paper Mache is syncing. There is a settings pane which you can access at any time, in any app, by tapping the top right corner of the screen. I am very fond of this little guy. The settings pane tells you the day and date what percent of battery life you have left. Turn on/off Wi-Fi as well as pick a wireless network. You take screenshots the same way as on the iPad: hold the Lock Button and the Center Button down at the same time. When you take a screenshot there is a large yellow orb that appears in the center of the screen. Presumably it is meant to imitate a camera flash or something, but it is very gradient-y and pixelated. It’s ugly. It is very easy to accidentally lock up the device or freak it out if you happen to hit the volume rocker at the same time you are trying to hit the Lock Button and Center Button. This happened to me a few times, and once there was a several-minute stint where every time I hit the Center Button it would take a screenshot. One thing I like about the screenshots is that they get their own photo album, and all screen captures go into that photo album by default. When the TouchPad is in USB mode, you can easily transfer screenshots over to your computer. They are in a top-level folder titled screencaptures. And when you see them, you find that they are named using the name of the app you were in, the date, and the time. For example, the aforementioned screen grab of shawnblanc.net that I took from the webOS browser is named browser_2011-01-07_114048.png. This is clever, but in some ways it backfires. The screenshots are sorted alphabetically, and so if you take a screenshot and then want to attach it to an email (you can do that in webOS) it very well could be in the middle of the album rather than at the end. Just Type makes for a nice one-stop-shop for quickly launching a Google search or getting a note or email started. It just works, and it works well. Using Just Type as my go-to for starting an email, composing a tweet, or launching a Web page takes some getting used to. But, when I do remember to use it (rather than launching the app first), it is faster than launching the browser, tapping into the address field, and then typing out the URL. I found typing on the TouchPad just as easy (or just as difficult) as typing on the iPad. There is the familiar click, click, click that accompanies the typing on the keyboard, and the keys are pretty much the same size. The layout is slightly different, though. For one, the keyboard has a number row at the top. I regularly found this fifth row to be very useful. Secodly, you can adjust the height of the keyboard between XS, S, M, and L. It would be nice if the height settings were orientation-specific. If you prefer the small keyboard height when in portrait orientation but medium when in landscape, you have to manually adjust it each time. I just leave it on medium at all times, and rarely do any typing when in portrait. As for typing with a Bluetooth keyboard, I didn’t buy HP’s Touchstone accessory and keyboard because I already own a Bluetooth keyboard of my own. Alas, I was not able to pair my Apple Bluetooth keyboard with the TouchPad. It literally took 5 minutes of refreshing the Bluetooth search on the TouchPad before it saw my keyboard, and that was followed by another 5 minutes of failed attempts to pair them. And so, no, I did not type this review on the TouchPad. You don’t get the magnifying glass when trying place the cursor in an exact spot. It is hit and miss. If you miss you can try again or else use the backspace key to delete all the text to the left of where you actually wanted the cursor and then retype it. My advice: aim a little to the right. The text highlight color is yellow in webOS. Once I’d selected a word or a letter I found it nearly impossible to grab the little handles and adjust my selection. The touch targets must be too small or something, but it always takes great care and usually several tries before being able to get hold of a handle and select more text. To get your cursor to the very end of a document, it would appear that you literally have to tap in that exact spot. On iOS if you tap anywhere below the last line of text the cursor is automatically placed at the end of the document as if you hit page down. webOS does in fact work the same way, but the cursor doesn’t actually appear to be in place. You have to trust that it’s there at the end and simply begin typing. In short, text selection is near the top of my list of things that bug me most about the TouchPad. Yes, the features themselves are there, but the functionality is only just passable. It can almost be less frustrating to settle the fact that you can’t do something rather than to have the hope of being able to do it yet never fully realizing that hope. The system font for webOS is Prelude. If you visit this page which John Gruber set up 4 years ago to show the iOS system fonts, you’ll see that nearly none of the iOS system fonts are included with the TouchPad. The ones which do render are: Arial, Courier New, Georgia, Times, Times New Roman, and Verdana. In Paper Mache, the Instapaper app for webOS, the font options it offers you are Prelude, Arial, Verdana, Georgia, and Times. What we would call the Home Button is called the “Center Button” on webOS. If you enlarge a Flash video to full screen then the TouchPad tells you “Tap the Center Button to return.” However, in the settings for Screen & Lock, the TouchPad lets you know that “The center button blinks when new notifications arrive.” In once instance “Center Button” is capitalized, and in another instance it is not. There are times when certain screens or apps look just barely out of focus. Like a Photoshop document that is zoomed to 95-percent — it’s almost in focus but not quite. Part of me can’t help but wonder if the out-of-focus bits are simply scaled-up graphics from the phone-sized version of webOS. In the Music app there are four sub-categories under the main Library listing: Songs, Artists, Albums, Genres. If no songs are in these sub-categories then a message appears where the track would otherwise be listed. The message has a large monochrome icon above it. For Songs, Albums, and Genres the icon and the message are centered on the track listing are. For Artists, however, the icon and message got left up into the top left corner on accident. The App Catalog home page, when in portrait orientation, is quite off balance. You can see how the description bubble above Categories is a few pixels higher than the other three. The margin to the left of the 4 center boxes is less than the right margin, and there is a different left margin width for heading, the top-level paragraph, and the center boxes. However, it only looked like this for a few days. On Monday the Catalog home page was replaced with the cover of Pivot, the app discovery magazine put out by HP. I had been unable to find Pivot in the App Catalog until it arrived on its own, and so my guess is that Pivot and the App Catalog are one and the same. You will always see that month’s issue of Pivot every time you open the App Catalog, and since you cannot launch the App Catalog without an Internet connection neither can you read Pivot offline. For icons, there is not the same standard “form” for all icons like there is on iOS. As such, they feel very loose and non-unified. Not to mention that some icons are pixelated, some are not. That is not to say that every icon in iOS is beautiful — far from it. But the unity and consistency of iOS icon shapes at least add to the overall aesthetics of the Home screens. You have a Pre and you are desperate to use the advantages that come with the unified operating system. Being able to say that your tablet has Flash is more important than being able to use Flash. You take great delight in webOS and have great faith in its future. So much so that you’re willing to tolerate the annoyances, frustrations, and dark corners of the TouchPad in hope that they will get ironed out. As a tech writer it was great to be able to use and live with the TouchPad for a while. There are many things I appreciate about webOS, and I’m glad I was able to spend some time with a non-Apple device for once. But, alas, the TouchPad is far less likable than I expected it would be. As it is I would not recommend it to anyone I know — even my friends with webOS phones.